This was fun for me to make and in my little tiny kitchen I had the biggest disaster zone! But, big messes can create delicious treats so it’s worth it. 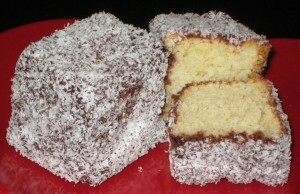 A Lamington is a traditional Australian cake served for tea or dessert. 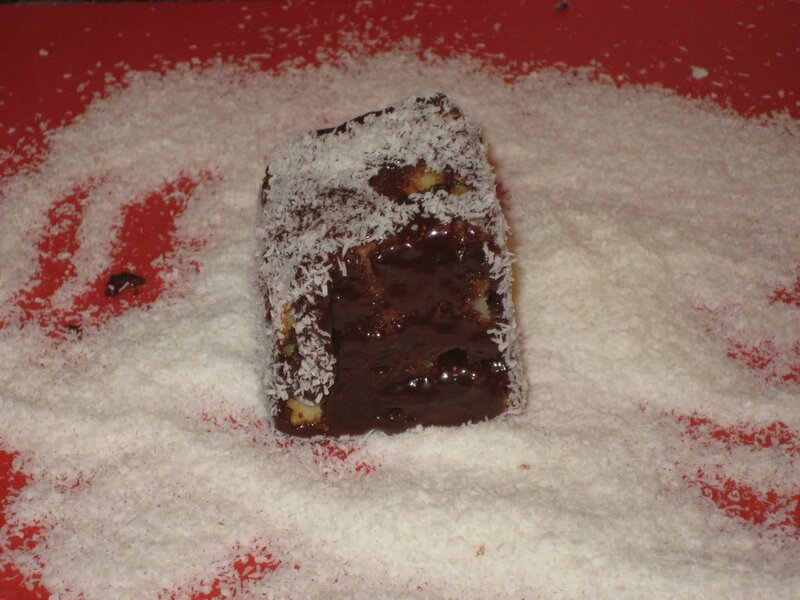 I saw these little squares of cake coated in chocolate and coconut on a TV show from Australia. I love those cooking shows. And I’m all for afternoon tea with some cakes and sandwiches to tide me over until dinner. The origins of making this cake came from using up leftover sponge cake that was served at morning and afternoon teas. 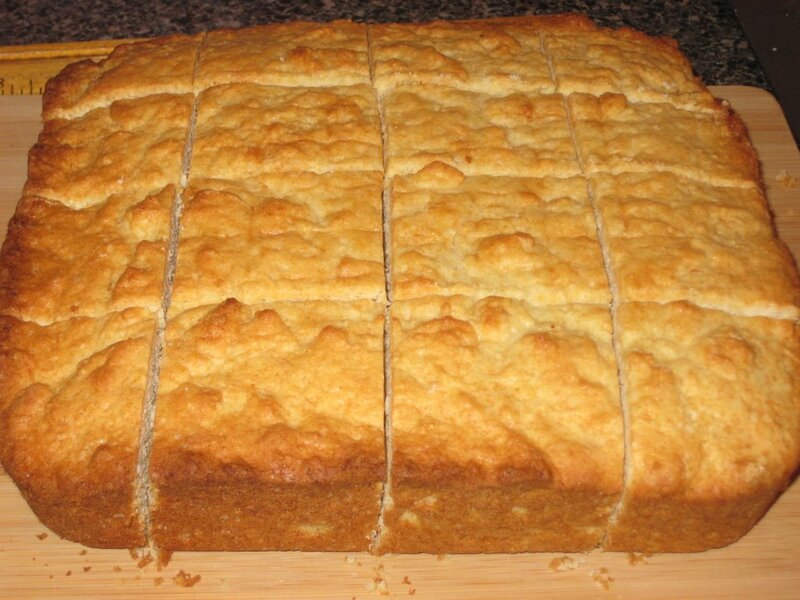 Of course in my house you would never have a plain leftover piece of cake so just make a simple sponge cake recipe. A few of the articles I’ve read tell you that they would cut this cake in half and layer it with jam and whipped cream before cutting it into squares and coating it. The thought of keeping those squares with slippery whipped cream in the middle worried me so I’m saving that for my next try. The cake is the easy part in this recipe. It takes an assembly line and patience to assemble the little cakes. Preheat oven to 350 degrees F (180 degrees C) and place oven rack to middle position. 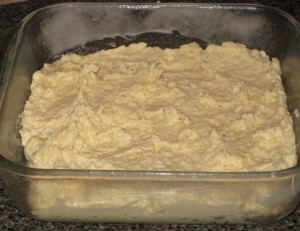 Butter, or spray with a nonstick cooking spray, the bottom and sides of an 8 inch (20 cm) square cake pan. Set aside. If you line the pan with parchment or baking paper you may have less crumbs when coating. Though the thought just occurred to me that if you had one of those individual brownie pans these would be ideal. A little smaller and 1.5 inches instead of 2 inches but I think it would be a great size. You may also have to adjust your cooking time. 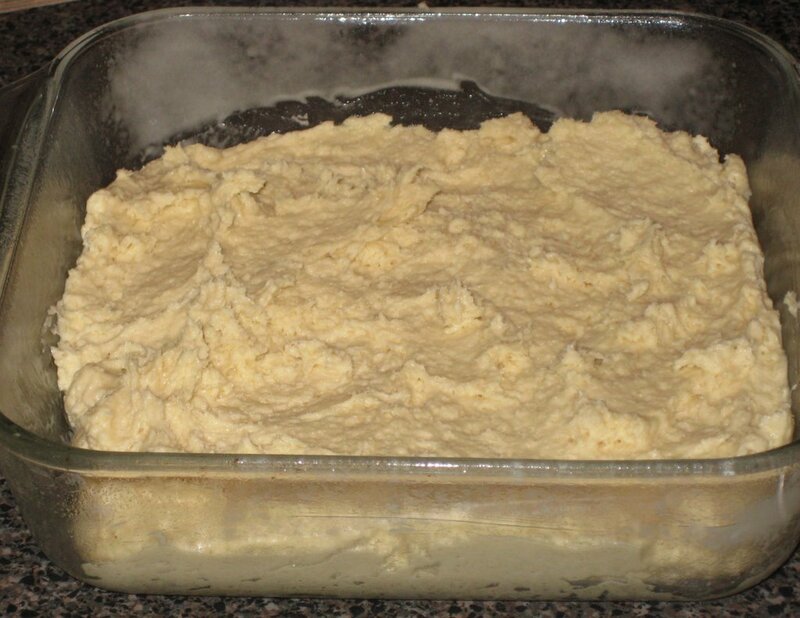 In a large bowl sift or whisk together the flour, baking powder, and salt. Set aside. In bowl of electric mixer, beat the butter until soft. Add the sugar and beat until light and fluffy (about 2-3 minutes). Add eggs, one at a time, beating well after each addition. Scrape down the sides of the bowl. Add the vanilla extract and beat until combined. With the mixer on low speed, alternately add the flour mixture and milk, in three additions, beginning and ending with flour. 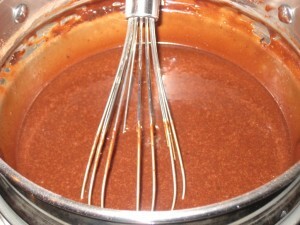 Spread the batter into the prepared pan and smooth the top with an offset spatula. Bake in a preheated oven for approximately 25-30 minutes, or until a toothpick inserted in the center of the cake comes out clean. Cool the cake in its pan on a wire rack for 10 minutes. 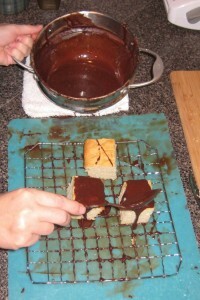 Place a wire rack on top of the cake pan and invert, lifting off the pan. Re-invert. Once the cake has completely cooled cut it into 16 two-inch (5 cm) squares. Wrap the cake in plastic wrap and refrigerate for several hours or even overnight. The reason for doing this is that it is much easier (less crumbs) to coat a cold cake with frosting. Place the confectioners’ sugar, cocoa powder, butter and 1/2 cup (120 ml) milk in a heatproof bowl over a saucepan of simmering water. 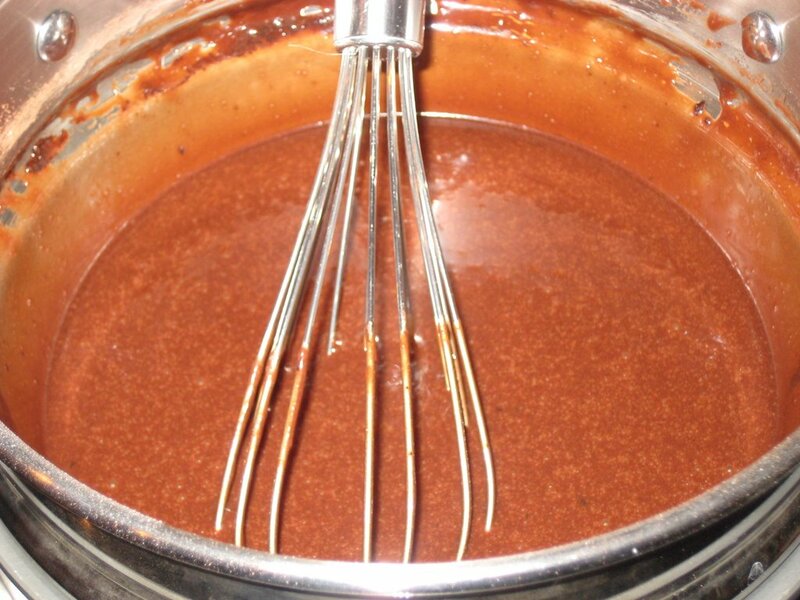 Stir the mixture until it becomes smooth and of pouring consistency. 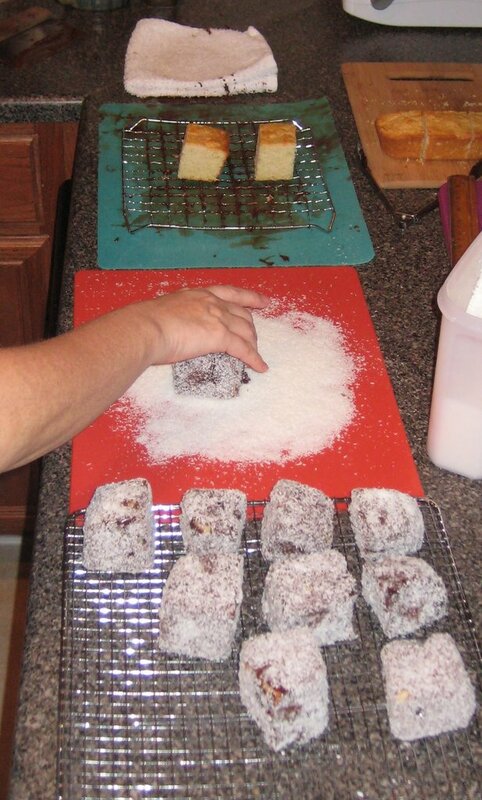 Make a production line; put 4 to 6 squares of cakes on a wire rack that is placed over a baking sheet (to catch the drips). A flexible cutting mat works great for this. Spread the coconut on a large plate to be able to roll the chocolate coated cake. Set a wire rack on at the end of the assembly line to place completed cakes on to set. Spoon or ladle the chocolate frosting over each square of cake, making sure you cover all sides. Leave the chocolate set up for a minute or 2 before turning it so it doesn’t just stick to the rack. I’d like to devise a way to just dip these in the chocolate to make it easier to cover more sides at once. I worried I’d get too many crumbs in the chocolate. Maybe a flat saucepan you could roll them in. Another day! With a small offset spatula or knife transfer the chocolate covered cake to the plate of coconut and roll the cake in the coconut, covering all sides. Gently transfer the Lamington to the clean wire rack to set. Repeat with the rest of the cake squares. Makes 16 2-inch (5 cm) squares.